Katie Stoll is a genetic counselor in Washington State. She graduated from the Brandeis University training program in 2003 and since that time has held positions in the areas of prenatal, pediatric and cancer genetic counseling. We recently said good-bye to Adrienne Asch, a thoughtful and powerful voice in bioethics, disability, and reproductive rights. Adrienne passed away at her home in New York on November 19, 2013, surrounded by the love of many friends and family. Adrienne touched my life deeply in the brief time I knew her and I am grateful to have had a connection with her. Her perspective has significantly shaped the way I view the genetic counseling profession and my role within it. Adrienne was an accomplished scholar and an incredible person. Several beautiful tributes speak of character and her accomplishments, and these only give us a glimpse of her impressive body of work. See the The New York Times, as well as blogs related to philosophy, feminism, and bioethics for more about Adrienne. Many genetic counselors are aware of Adrienne’s focus on the intersection of disability rights with reproductive technologies. She was supportive of abortion rights, but questioned the implications of prenatal diagnosis and selection for disability rights, for individual parent expectations, and for humanity. She asked the question, if individuals with disabilities are not welcomed into family life, how can we expect inclusion in schools, in the work place, in society? At one point the interviewer asking Adrienne if she had ever had the opportunity to address genetic counseling students. Adrienne has been an outspoken critic of prenatal diagnosis and this has made her quite a controversial figure among genetic counselors. Anna: Yeah. How did that go? Anna: [laughs] What [laughs]…what did you say to them? Adrienne: The same kind of thing I’m saying to you. But it challenges…I mean, maybe that I haven’t said it gently and kindly enough and I’m trying to do that. I have sympathy for how difficult it is to do this work. But I have no sympathy for people telling me that parents aren’t interested in this information or it’s not appropriate to give them the kinds of information that I’m describing. I think in fact that’s what genuine information is. Recently, I had a chance to work closely with Adrienne when she helped to conceptualize a symposium for the National Society of Genetic Counselors Annual Education Conference, Reaching for Common Ground: Prenatal Genetic Counseling and Disability Equality. Although Adrienne’s health prevented her from traveling to Los Angeles for the meeting, she was determined to hear all of the presentations live and to participate in the conversation. We achieved this through the technological miracles of cell phones, speakers and microphones for the entire 6 hour conference and this allowed her to both listen and contribute to the conversation. In early October, she recorded a video for this conference and the National Society of Genetic Counselors has kindly allowed me to share it here. I encourage you all to take the time to listen to Adrienne’s final address to genetic counselors. I think she finds the balance she was striving for in being sympathetic to the difficulties inherent in the work of genetic counseling and remaining strong in her challenge to our profession to be more than genetic educators. …Just as life is made up of many experiences that are shareable, you don’t need to have particular characteristics in common to share a life and to share experiences. And you as a genetic counselor have an opportunity to communicate that to prospective parents. And ask prospective parents to think about what they want in their family’s lives. And whether a child with a particular characteristic you can name in advanced will make the achievement of those goals any harder or any less possible. 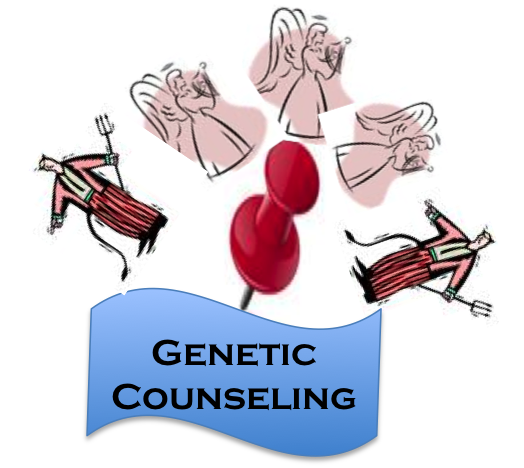 Part of our fundamental core professional values as genetic counselors is to be non-directive in our counseling – not to decide the morally ‘right’ path for pour patients. We strive to support individuals to choose the path that they decide is right for them. Our responsibility as genetic counselors is to do our best to make certain that the decisions people make are as informed as possible. What Adrienne helped to crystallize for me is that part of ensuring informed decisions requires inquiry into of the prospective parent’s expectations, hopes and dreams. It may also call for us to challenge misconceptions about how life with a disability is imagined and this may need to begin first with examining our own misconceptions and biases. Adrienne certainly dismantled my preconceptions about life and limitations for someone who has been blind since shortly after birth. Although too short, her life was undeniably rich and full and her contributions were many. I imagine there are many DNA Exchange readers who have some interesting reflections about Adrienne of their own. I hope you will share them here.